The Big Wobble: Portland's air pollution exceeded levels in Beijing with heat records tumbling as Thursday was one of the hottest days has ever seen! Portland's air pollution exceeded levels in Beijing with heat records tumbling as Thursday was one of the hottest days has ever seen! Thursday was one of the hottest days Portland has ever seen. A high of 105 degrees at the Portland International Airport landed Thursday in the top 10 hottest days on record for the city, just 2 degrees shy of the city's all-time high of 107. The last time Portland hit 105 was in 2009. And Portland is on track to set another record: the longest streak of days with temperatures above 90 degrees. The current record is 10 days, set in 2009. As of Thursday, four consecutive days have been above 90 degrees, said Amanda Bowen, a National Weather Service meteorologist. But the weather service predicts the streak will continue into next week, with highs in the mid- to low 90s predicted until next Thursday. "Looking forward, we have a pretty high potential of having 10 days in a row," Bowen said. "We may actually break the record that was set in 2009." An excessive heat warning remains in effect through Friday night. But the weather service predicts the mercury will fall slightly Friday, which is expected to have a high near 96 degrees. Still, it's a slight reprieve from the triple-digit temperatures that scorched Portland on Wednesday and Thursday. Thursday's high blew through the previous daily record for Aug. 3 of 99 degrees, set in 1952. Wednesday set another daily record with its 103-degree heat, shattering the previous Aug. 2 record high of 96, set in 1986. Portland's triple-digit temps were among the hottest in the nation Thursday. Parts of California, Nevada and Washington also hit triple digits, but much of the country had highs in the 80s and 90s instead, according to the National Weather Service. As hot as it was, though, a thick layer of smoke hanging over the Portland area kept temperatures a few degrees lower than they might have been otherwise, the weather service said. The smoke certainly had its downsides. 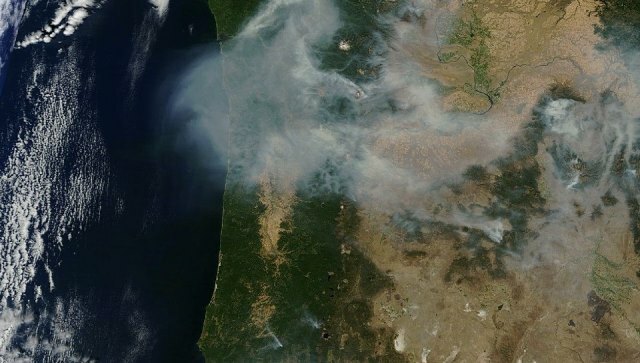 The haze, a product of several Northwest wildfires, caused poor air quality in northwest Oregon and Washington. Portland's air quality was among the worst in the country this week, according to the Portland Air Quality Index, a national standard used to measure the health effect of pollutants. The city's air pollution exceeded levels in Beijing. With temperatures soaring, we are now in the dryest point yet of the season here in Oregon and Gov. Kate Brown has declared a state of emergency in response to the wildfire activity across the state. With fires blazing and the hot, dry and windy conditions Oregon now has multiple red flag warnings, putting the Beaver State in "critical fire danger situation". With the state of emergency, this enables the Oregon National Guard to mobilize resources on an as-needed basis to help assist firefighters. Just some of the fires we know of so far: Just south of the Oregon border near Klamath Falls, the Modoc July Complex is nearly 74,000 acres and burning. Southeast of Bly, The Devils Lake is burning at reported at 1,200 acres. A level 1 evacuation notice has been issued to some residents of Middle Fishhole Creek Road. Just 9 miles northeast of Prospect is the Blanket Creek Fire at 1,369 acres with 7 percent contained. In the Kalmiopsis Wilderness, the Chetco Bar Fire is currently at 2,907 acres in the Rogue-River Siskiyou National Forest.